I am back in the Colosseum, dry this time. Easter weekend heralded a two-week vacation at NJC; I had the choice between taking some time to myself for the fortnight, or of travelling with the students on one of two compulsory trips. 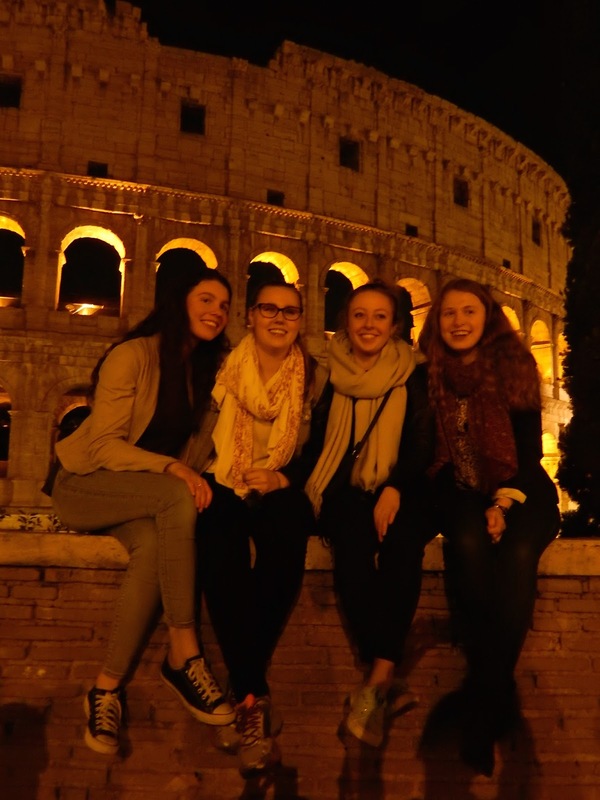 I opted to supervise the affectionately called "Gritaly" trip–a week in Italy followed by a week in Greece. It was a repeat excursion for me. Because I followed this itinerary last year, and wrote extensively about the trip, I have decided to write fewer blog posts this time around, with a focus on those places and experiences that were new to me in 2016. 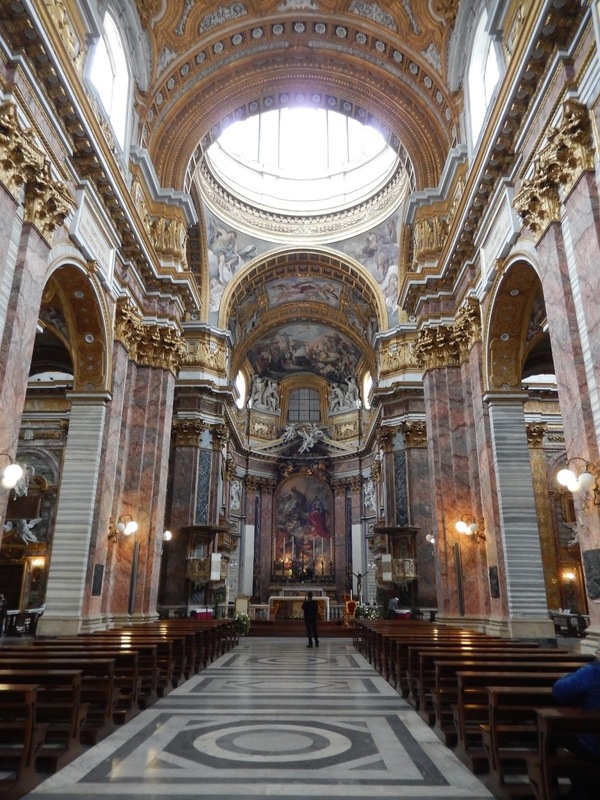 If you are curious about our visit to Rome last year, check out these two entries. Obviously, the first big difference was the group who were on the trip. There were forty-nine students and five supervisors this time around (Jen, Patti, Adam, Louise and me). Jen's thirteen-year old son, Jacob, also joined us, as did our social media intern, Kezia. Hence, there were 56 of us. The brick facade of this church belies the wonders inside. 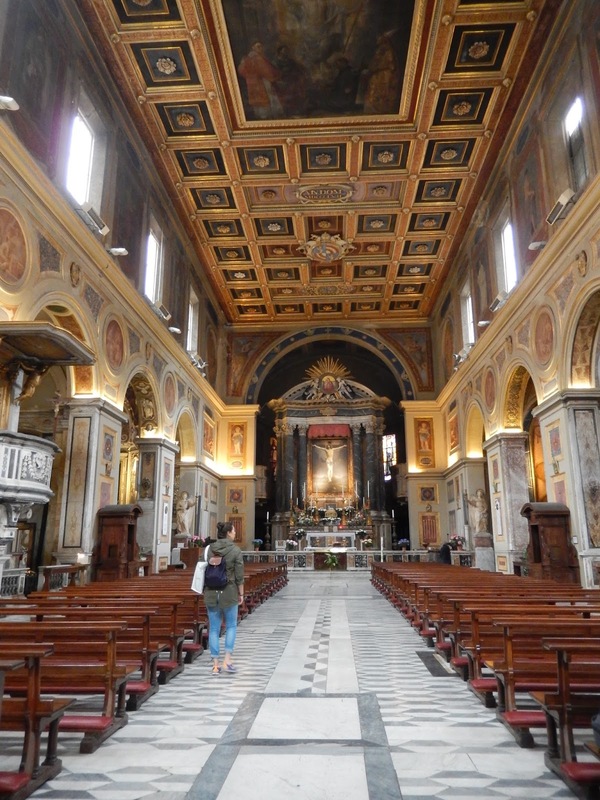 Before our first dinner in Rome, Patti agreed to join me as I visited a church near our hotel which I had not entered last year: the Basilica of Santa Maria degli Angeli e dei Martiri. 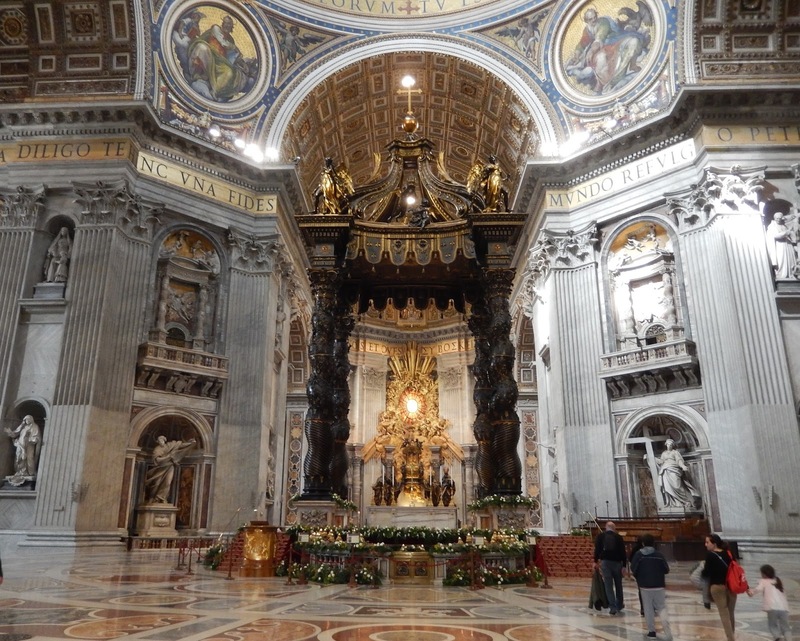 The plain brick exterior suggests a simple space, but upon entering the Basilica, we were impressed by the size and grandeur of the interior. 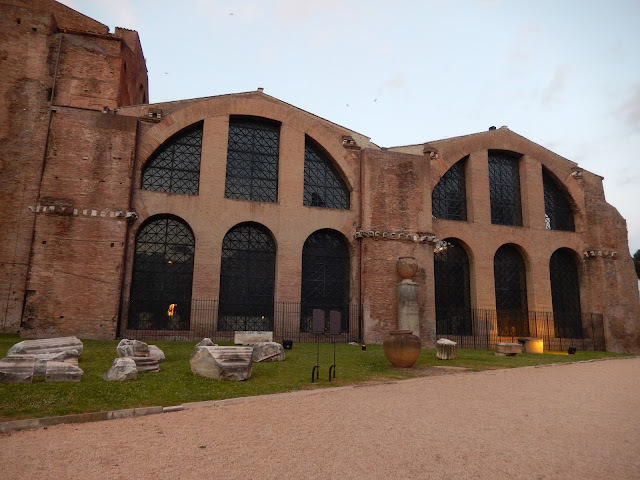 In fact, this church was erected on the site of the Baths of Diocletian, the largest of the imperial baths. 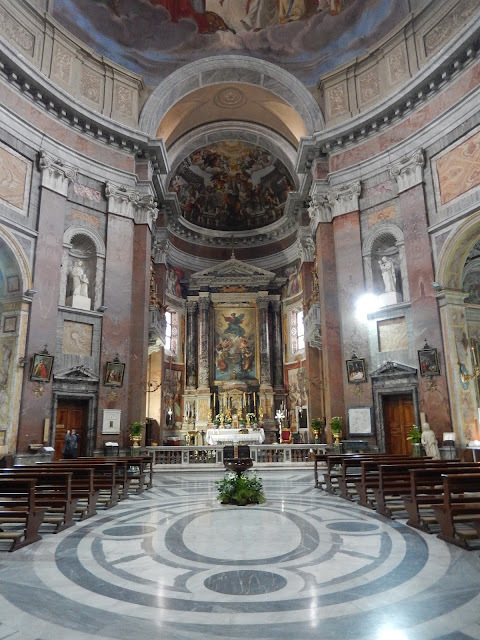 Here was a reminder of Rome's layered history, as first the centre of an Empire and later as the seat of Christianity. After dinner, we took advantage of beautiful weather to walk with the students to the Colosseum to see it lit up at night. We all enjoyed posing in front of Rome's most iconic structure. 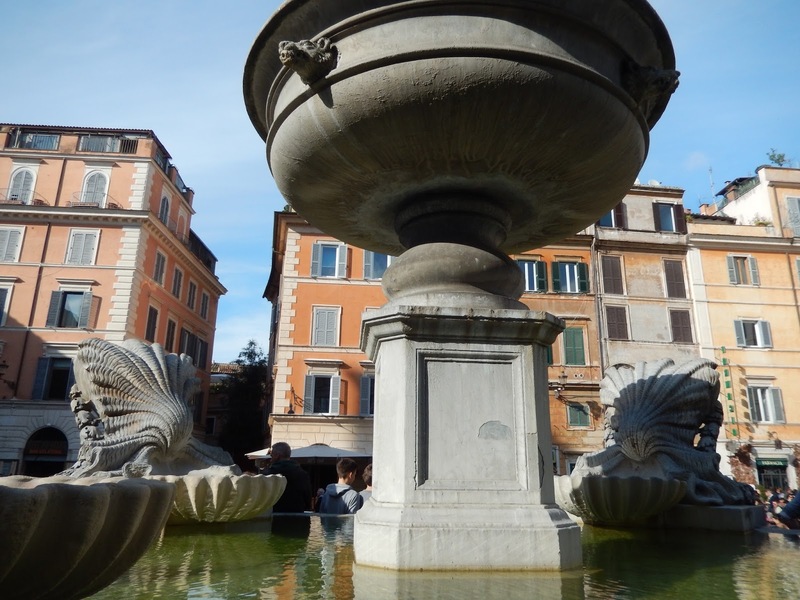 On our second day, we followed our guides on a walking tour though the city. I expected to retrace the same route as last year, and for the most part, we did, but there were a few twists this time around. 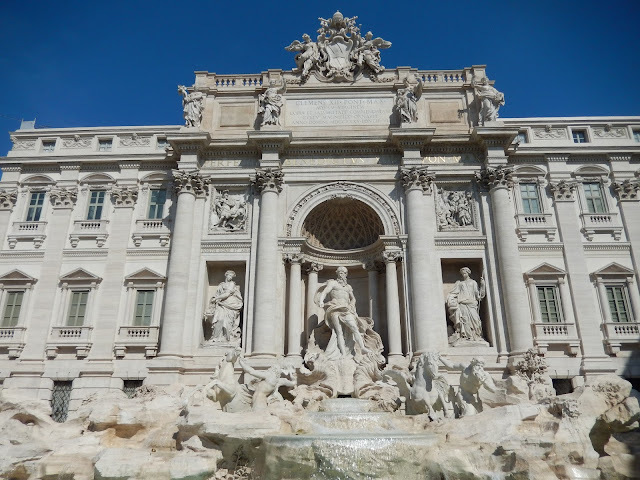 Notably, we found the Spanish steps under renovation, while the Trevi fountain was (finally) fully restored. We may all hate seeing scaffolding on important sites but when the restoration is complete, the effect is spectacular. The gorgeous Trevi Fountain, fully restored. After the tour, the students dismissed, we sought out new places to visit. 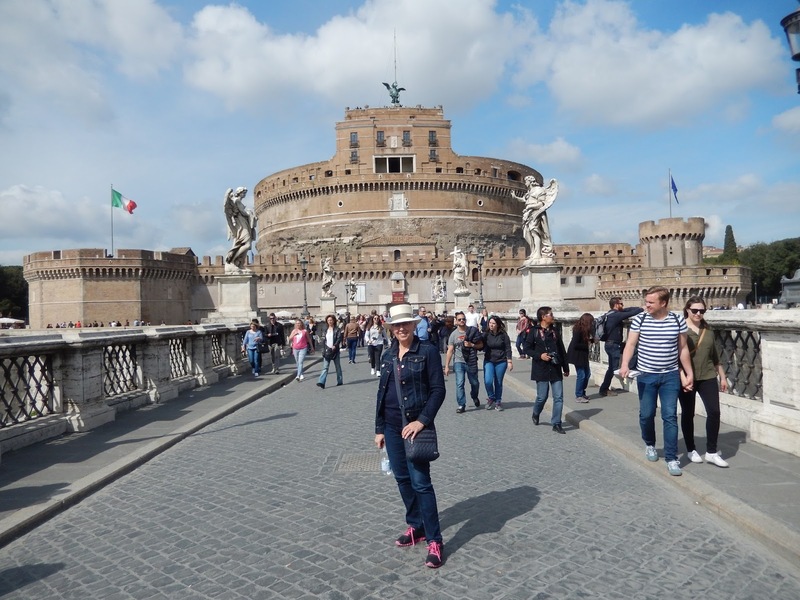 Patti, Louise, Adam, Kezia, Jen and her son, Jacob, and I headed first to the Castel Sant'Angelo, another site with important Roman and Christian associations. Built as a tomb for the Emperor Hadrian, it was later used as a prison for the Vatican. 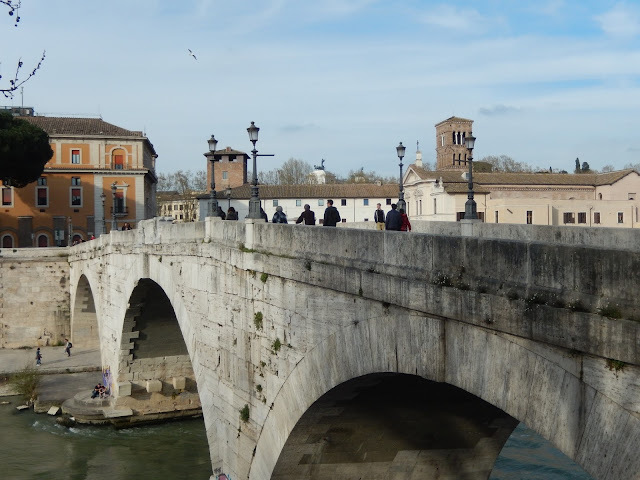 The bridge that leads to it, the Ponte Sant'Angelo, is particularly lovely, adorned as it is with marble statues of angels. 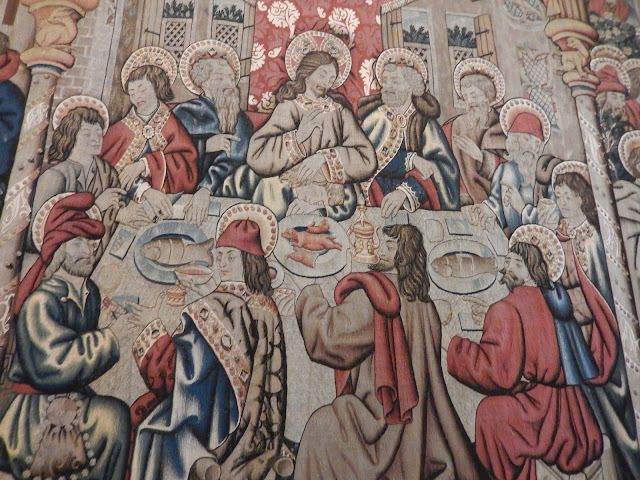 It is very old as well, dating back to 134 AD. From there, we decided to follow the Tiber River toward the Trastevere district. 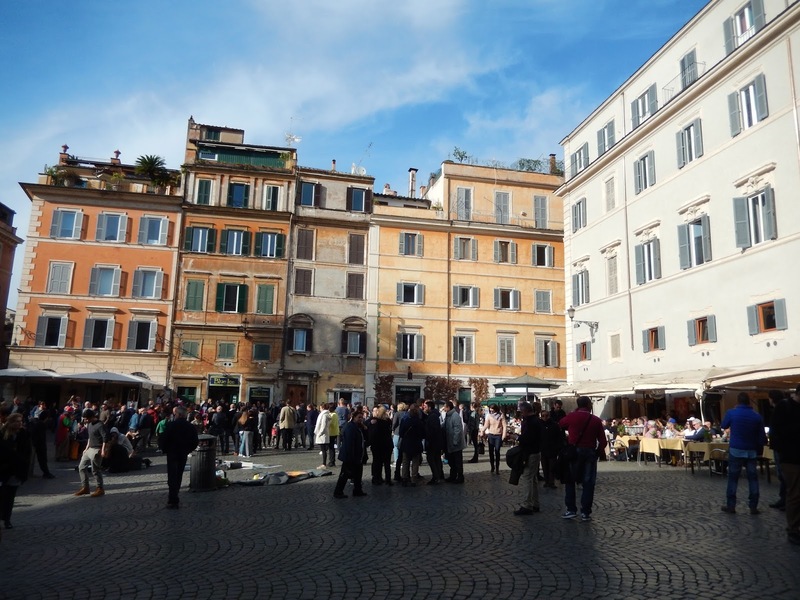 Travel writer Rick Steves had recommended this neighbourhood, and so I was keen to see it. 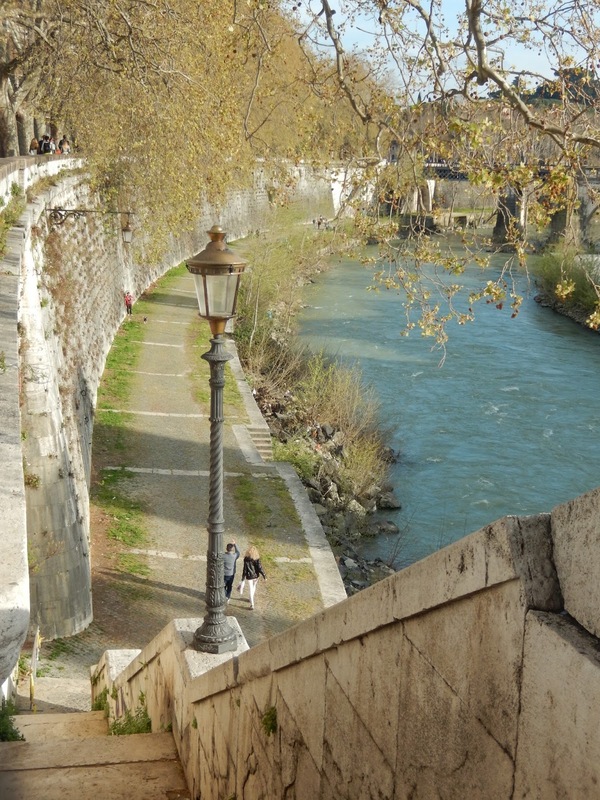 Louise also was eager to return to this, her favourite part of Rome. 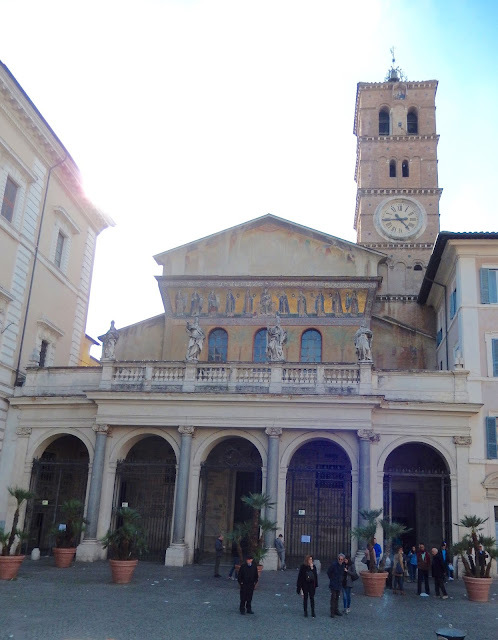 We spent the majority of our time in the centre of the area, the Piazza di Santa Maria, where we enjoyed some gelato and explored the 12th Century church, the Basilica di Santa Maria. 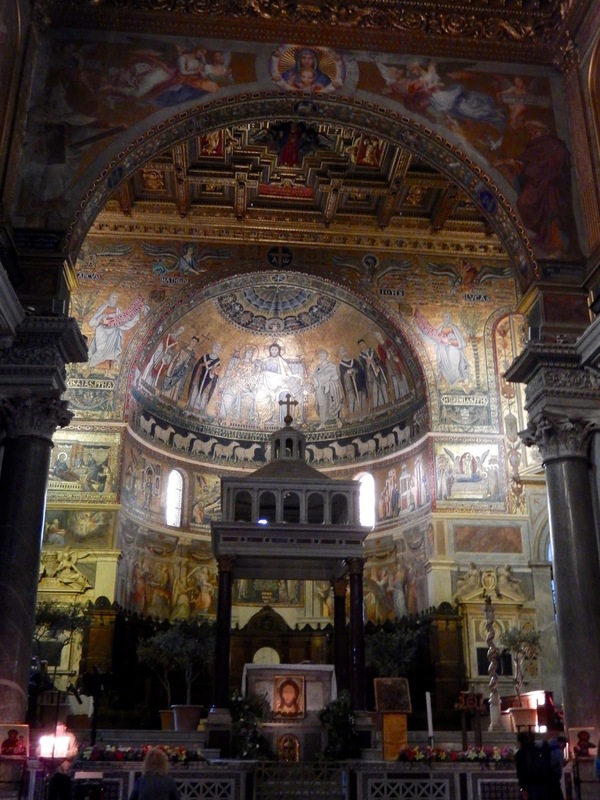 I was greatly impressed with the mosaics on its walls, reminiscent of Eastern European iconography. 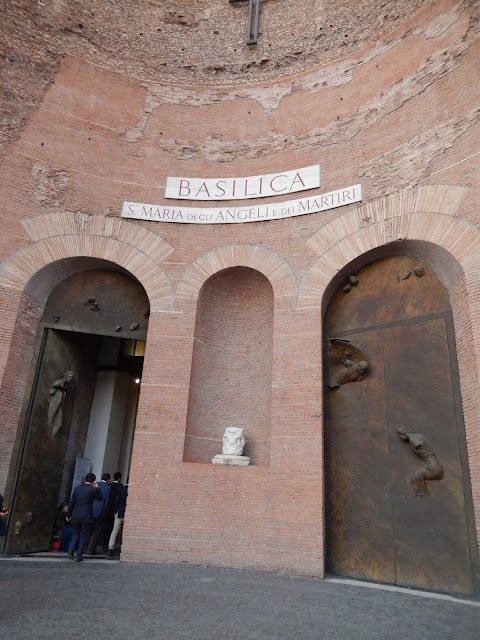 The modest exterior of the Basilica. Nearby, we found a street market where both Louise and I found earrings at bargain prices. Eventually, we headed back toward the river, and the island that lies within it. 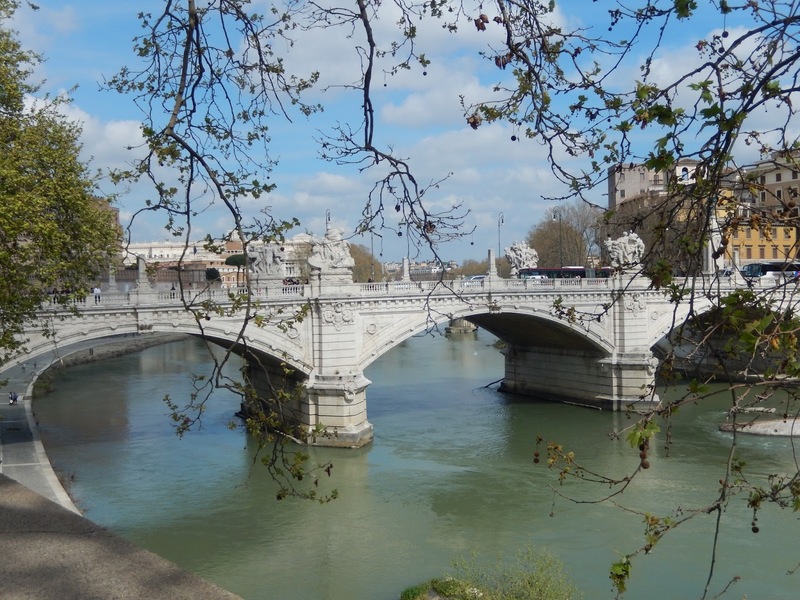 Despite having visited Rome twice previously, I had never seen the Tiber until this day. Can you imagine saying such a thing about Paris and the Seine? I was surprised at how little the river was used and how few people were enjoying its banks. 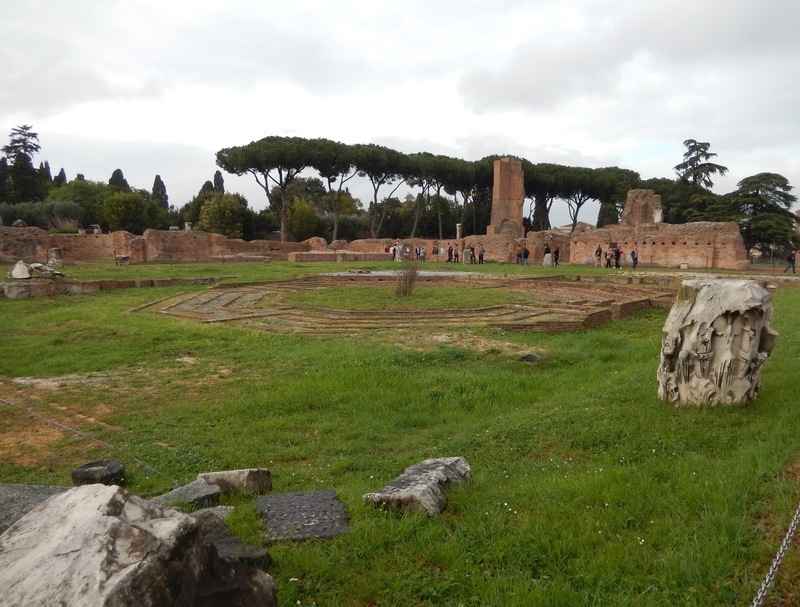 On the other side, we strolled past the ruins of Ancient Rome that we were scheduled to visit the next day, as we headed back to our hotel. 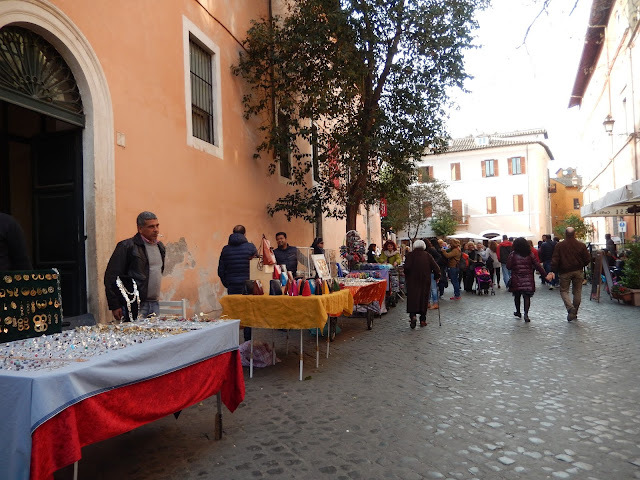 The next morning, in our free time, Kezia and I decided we would check out the shops while walking from the Piazza del Populo to the Colosseum along Rome's main street, the Via del Corso. This was really fun, as I found a fellow shopper who was also willing to pop into every church with me along the way. I find European churches beautiful, even those that are not top tourist attractions. 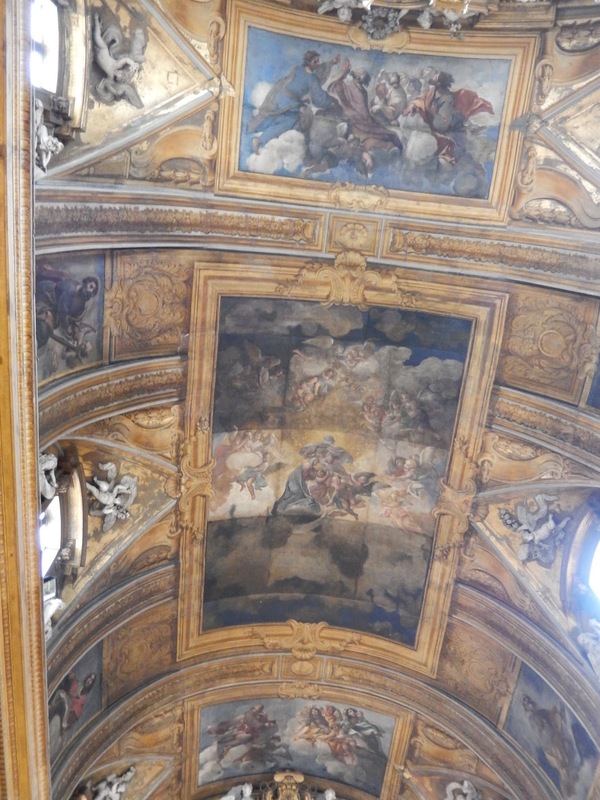 That morning, I enjoyed the beautiful art on the ceiling of Chiesa de Gesu e Maria; the marble grandeur of the Basilica S Giacomo; the baroque style of Basilica Dei SS Ambrogio e Carlo; and the unusual dimensions and facade of the Basilica di San Lorenzo in Lucina. In short, I liked them all. 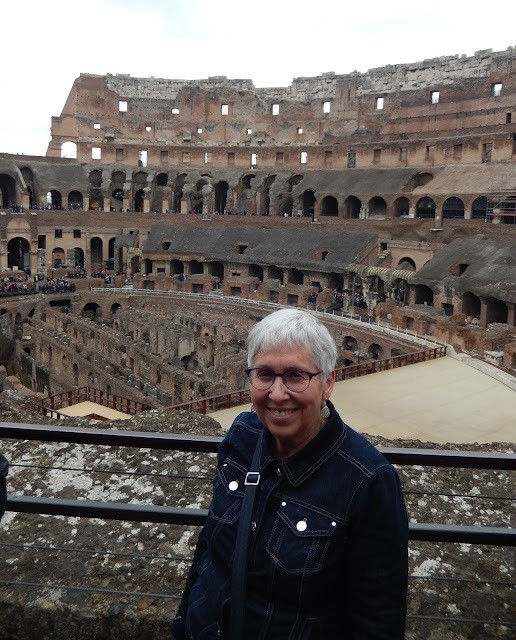 In the early afternoon, we met with the rest of the group at the Colosseum for our guided tour of Ancient Rome. I had taken such a tour last year too, but due to a heavy downpour, it was greatly abbreviated. This time, although it rained again, we were able to complete the tour. 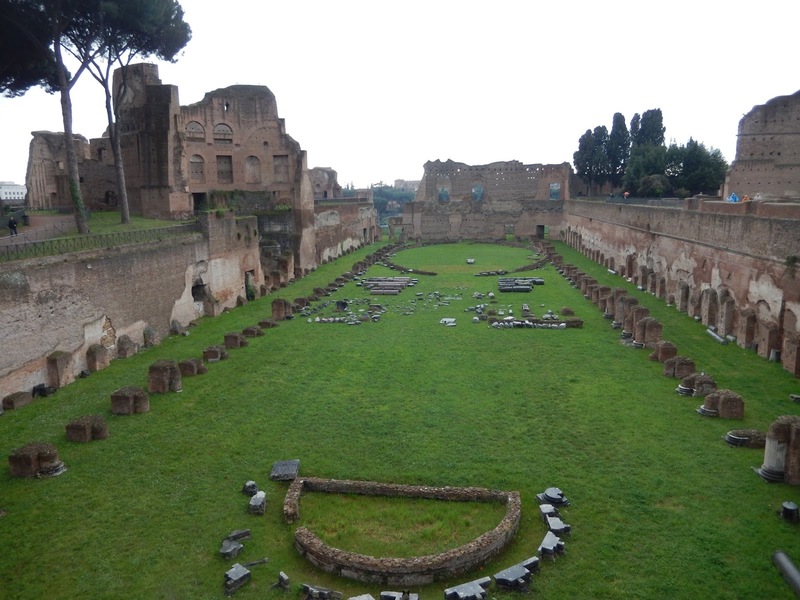 We spent about an hour in the Colosseum, and then another three hours on the Palatine Hill and in the Forum. 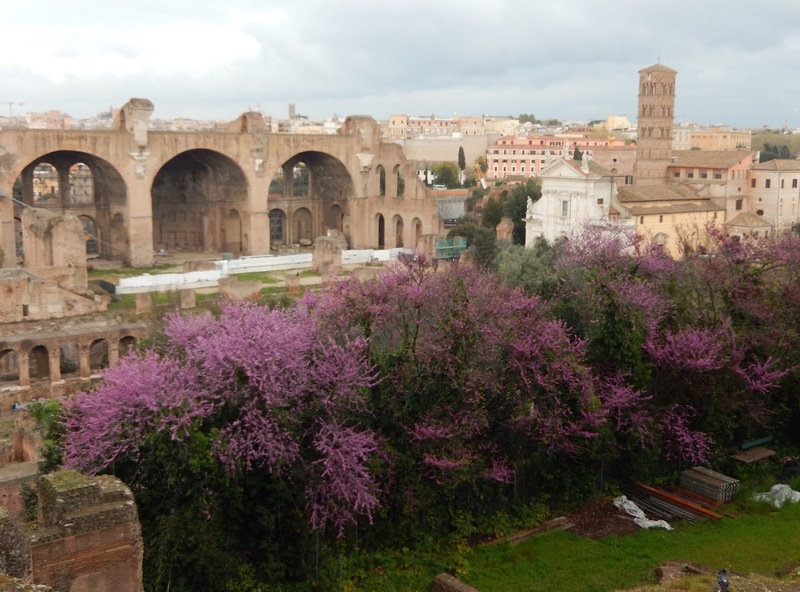 What can I say about the extensive ruins in the Eternal City? There is such history there! 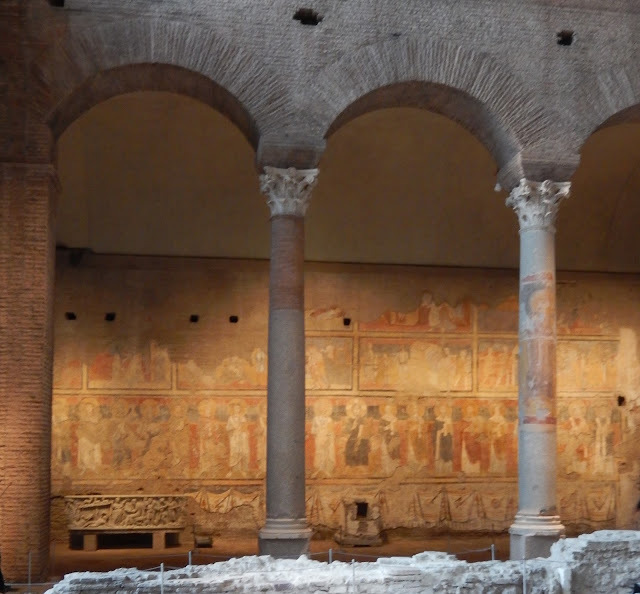 I enjoyed them immensely, imagining the world of the Roman people 2000 years ago. 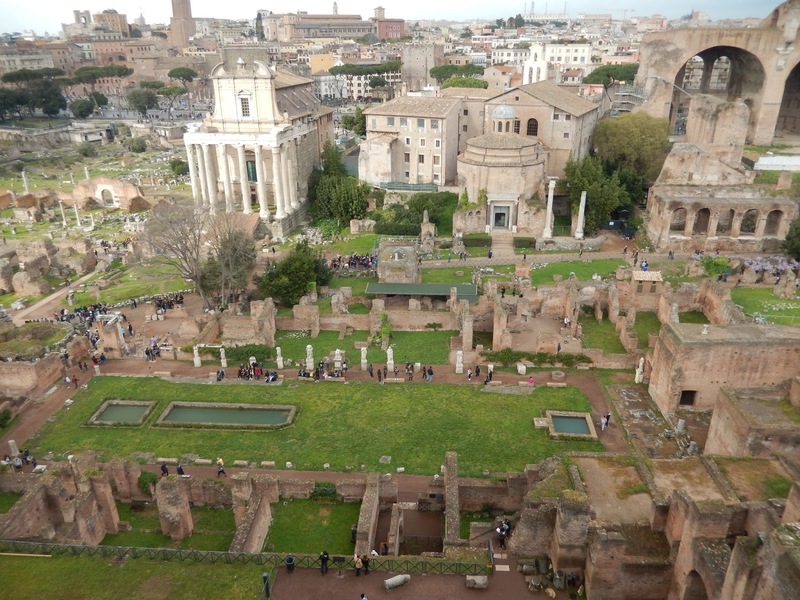 I also loved the views over the city, as we climbed high above the Forum. Trees were in blossom which only added to the beauty of the scene. 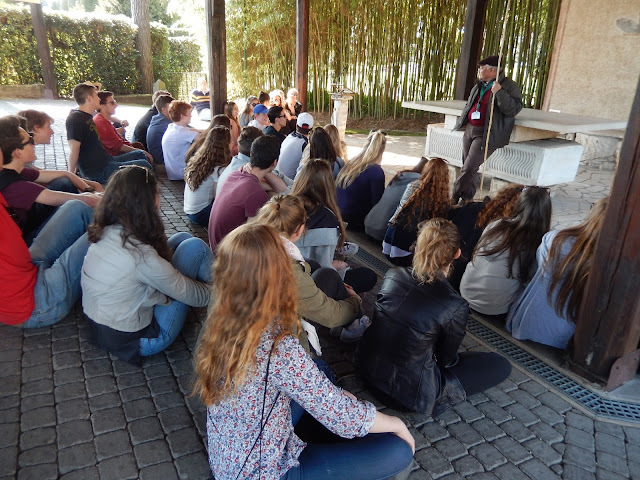 Four hours of listening to a guide took its toll on the students, however. It was hard work for all of us. They perked up a little when we arrived at the site of the Santa Maria Antiqua church which has recently been reopened to the public. This was a marvel, with its frescoes and mosaic floors. I loved it, but, as I have already indicated, I enjoy churches and ruins and this site had both. Our last morning in Rome was spent at the Vatican. The tour was very much like the one we had last year. 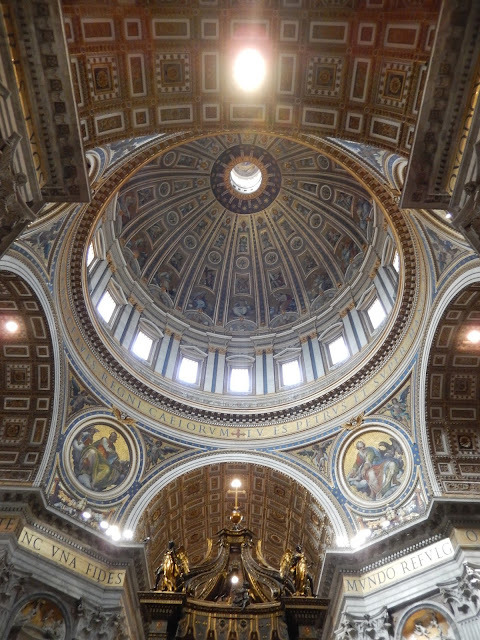 The wonders of the Vatican Museum never get old though. This time, I changed my focus a little. I found myself fascinated by the unique map room, and the 16th Century Flemish tapestries. 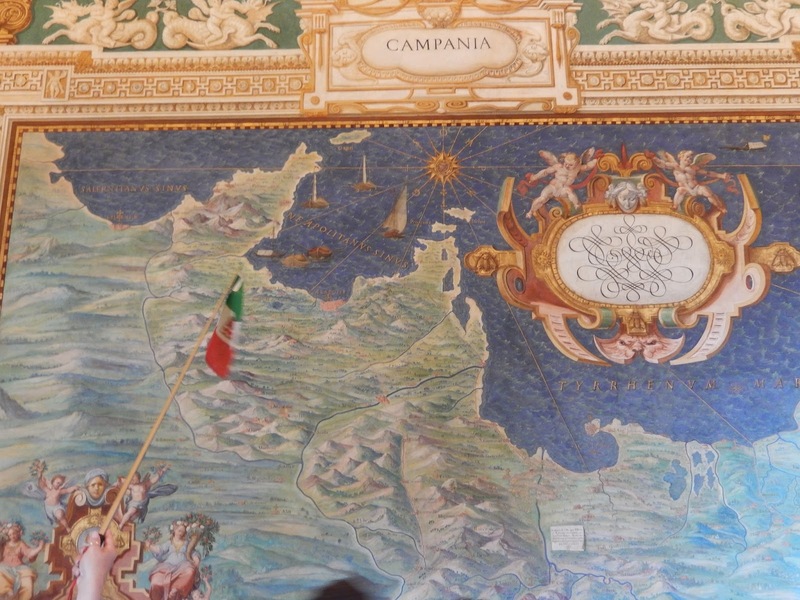 Our guide points out the Campania region of Italy where we will travel next. 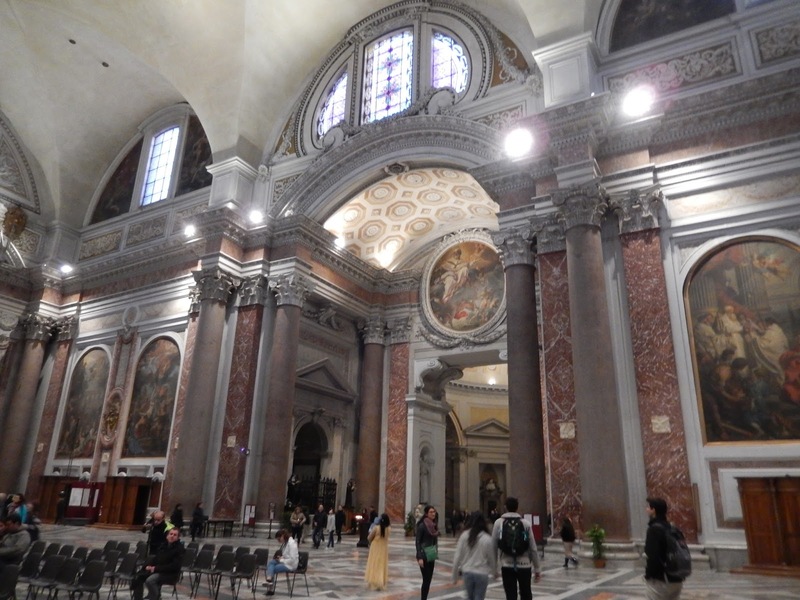 This time around, too, I was able to see much more of the Papal Basilica St. Peter's since there was no Mass going on. It is a magnificent building, even if it is always very crowded. 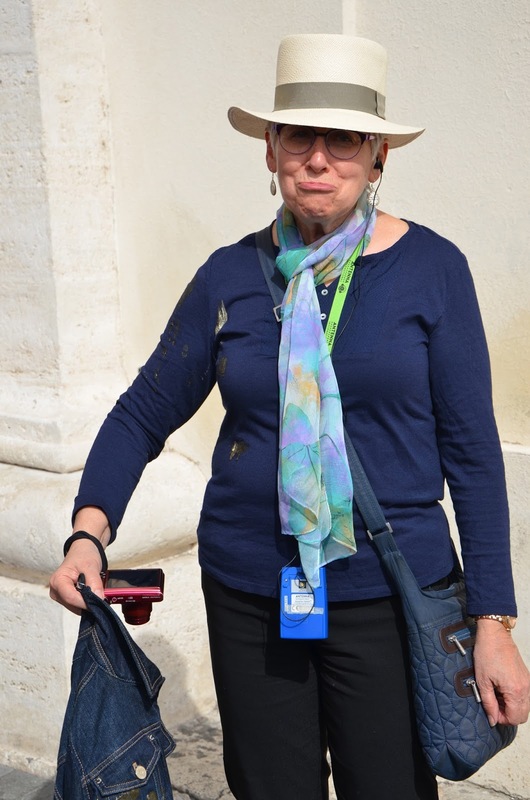 My visit was somewhat limited, however, as just before I entered the Basilica, a local pigeon decided to let go directly above me. Suddenly, my shirt and my jacket were covered in pigeon poo, an impressive amount for such a small creature. Fortunately, there was a washroom nearby and a nice Irish woman helped me clean up. This episode gave the students lots to laugh at; as for me, it is apparently good luck to be defecated on at the Vatican, so I am doubly blessed with good fortune. Recently "blessed" by a pigeon. By 1:30 that day, we boarded a bus to head for the next leg of our journey. 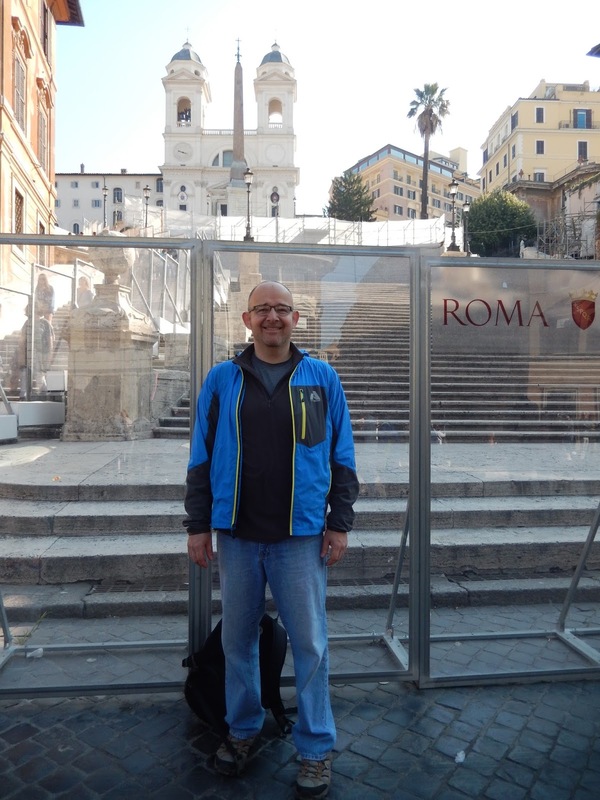 I enjoyed Rome and look forward to returning to the Eternal City one day.